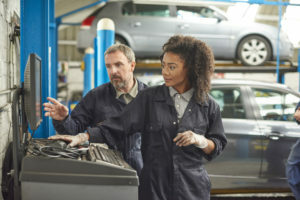 Years of on-the-job training could be required before a worker “graduates” from federal registered auto body repair and refinishing apprenticeships, according to templates provided by the Department of Labor. Federal registered apprenticeships entail businesses giving unskilled Americans jobs and teaching them the business while paying them an average of $15 an hour. At the end of the apprenticeship period (one to six years, typically four years), apprentices receive a credential which signals to other companies in the industry that the employee knows his or her stuff. More than 55,000 apprentices graduated nationwide in 2011. They are work process templates that are used during consultations with the private sector when they are exploring apprenticeship as a potential fit for their needs. They identify things like hours of instruction and certain competencies that are expected for these trades. Those documents suggest that companies evaluating a candidate with an apprentice credential can be fairly confident that the applicant is qualified. A federal spreadsheet lists both jobs as requiring 8,000 hours of training — more than four years under a typical 2,080-hour work year (40 hours times 50 weeks, presuming two weeks of vacation). However, the templates put the painter and auto body repairer apprenticeships at 6,000 hours each. It’s unclear if the program would provide college credit in addition to the credential; some apprenticeships do carry that extra perk. Repairs damaged bodies and body parts of automotive vehicles, such as automobiles, buses, and light trucks according to repair manuals, using hand tools and power tools: Examines damaged vehicles and estimates cost of repairs. Remove upholstery, accessories, electrical and hydraulic window‑and‑seat‑operating equipment, and trim to gain access to vehicle body and fenders. Positions dolly block against surface of dented area and beats opposite surface to remove dents, using hammer. Fill depressions with body filler, using putty knife. Removes damaged fenders, panels, and grills, using wrenches and cutting torch, and bolts or welds replacement parts in position, using wrenches or welding equipment. Straightens bent automobile frames, using pneumatic frame straightening machine. Files, grinds, and sands repaired surfaces, using power tools and hand tools. Refinishes repaired surface, using paint spray gun and sander. Aims headlights, aligns wheels, and bleeds hydraulic brake system. May paint surfaces after performing body repairs. May repair or replace defective mechanical parts. That description and subsequent discussion of technician skills feel a bit archaic and unreflective of the precision work collision repair now entails. (Still, it’s nice to see a reference to “repair manuals.”) But the notion of devoting thousands of hours to produce a well-rounded tech shows that the apprenticeship program’s heart is in the right place. The apprentice is expected to spend 1,000 hours — nearly half a year — doing metal work, described as “Disassembling, assembling, and aligning; roughing small dents with a hammer and dolly; dinging small dents with a pick and file; metal shrinking; welding and brazing; soldering; plastic filling; and repairing large dents using all of the above procedures.” This should teach them how to align, straighten and assemble parts and “fully understand the strains and stresses of damaged body panels,” according to the template. Repair frame horns; repair frames from under rear seat to rear cross member on unibody structures and conventional frames; repair frame from cowl forward to frame horns; repair bumpers and mounting structures; transfer and be responsible for major component and sub-assemblies, such as suspensions, engines and related parts, drive train, rear axle, braking systems, air conditioning and cooling systems. Finally, painters ought to appreciate that the auto body apprentice ought to better understand what the paint shop needs following the completion of the program. Paints surfaces of transportation equipment, such as automobiles, buses, trucks, and aircraft, applying knowledge of surface preparation and painting techniques, using spray painting equipment, power tools, and work aids: Cleans, sands, and applies chemical solutions to prepare and condition surfaces prior to painting. Mixes and thins paint or other coating to specified color and consistency according to standard formulas or color charts, using spatula or mixing equipment and viscometer. Masks and covers surfaces not to be painted. Sprays specified amount or thickness of primer, protective, decorative, or finish coatings, such as paint, lacquer, sealer, or enamel, onto prepared surfaces, using spray equipment. Strips, sands, masks, and repaints surfaces, and blends and polishes finish to match surrounding areas, manually or using portable power tools. May apply or retouch paint, using brush. May lie out and paint insignias, symbols, designs, or other markings on painted surfaces, according to blueprints or specifications, using stencils, patterns, measuring instruments, brushes, or spray equipment. May regulate controls on equipment to cure and dry paint or other coatings. May set up portable ventilators; exhaust units, ladders, and scaffolding prior to painting. May operate lifting and moving devices to move materials and equipment and access areas to be painted. May remove accessories from motor vehicles, such as chrome, mirrors, and windshield wipers, prior to repainting. The apprentice would under the template spend 500 hours each “Rough sanding of repair or rust spots,” “Masking around panels to be painted, “Removing paint,” “Sanding intermediate coats” and “Rubbing and polishing finish coats. Why would business bother with the additional red tape of a government apprentice program rather than just hiring somebody and training them to do all of this stuff on the job? Several reasons. Other materials from the federal agency indicate the kind of added benefits a shop and employee might receive. “International studies suggest that for every dollar spent on apprenticeships, employers may get an average $1.47 back in increased productivity, reduced waste, and greater innovation,” a recently completed apprenticeship task force report states. Having an apprenticeship program might make a shop more attractive to a potential employee than a hire-and-train-on-the-job competitive down the street. Employers receive national recognition on job search websites that they’re hiring apprentices — a free, high-profile “Help Wanted” ad. Apprentices are also guaranteed tiered pay increases as they develop certain skills, something that the guy down the street doesn’t have to provide. For that matter, the guy down the street might flake on his promise to teach the business to the new hire, while a formal mentor business seems likely to make good on the commitment. Employers who offer registered apprenticeships can tap into federal and state assistance the guy down the street can’t. “Businesses that register their apprenticeship programs can access many benefits, including a nationwide network of expertise and support at no cost, tax credits in many states, and funding and other resources from federal programs,” an employer-facing DOL publication on apprenticeships states. Finally, while the recognized certification admittedly makes it easier for your tech to jump ship to a competitor someday, in the near term, it provides an incentive for a worker to sign up with your shop and give you 3-4 years of good work. Besides, the employee might well stick around with the business who gave them a shot at an apprenticeship.